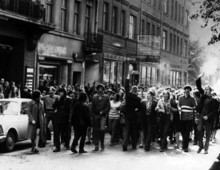 Cohn began by placing his paper in the broader context of his research on what he calls “prophylactic policing” in the Baltics from 1953 to 1991. His research uses both archival sources and interviews. Unlike many other parts of the former Soviet Union, the Lithuanian government has opened the KGB archives to research. Both Cohn and Rozenas have taken advantage of this unique context to conduct innovative work on the Baltics in the Soviet period. Cohn’s paper focused on one aspect of this “prophylactic policing,” the “prophylactic chat.” These “chats” involved “inviting” (in quotations because those invited had no choice in whether or not to attend) individuals rumored to have engaged in anti-Soviet activity. The meetings were reserved for minor offenders – those that the KGB believed would not go on to commit more serious crimes or engage in more sophisticated anti-Soviet activities. Interrogations and arrests were reserved for those perceived to be more dangerous than those invited for a chat. Cohn believes that this practice should be understood in the context of “Broken Windows Theory,” a policing philosophy, which surmises that the best way to head off major crimes is to crack down on minor ones. The KGB’s theory of “prophylactic policing” saw the same link between social disorder and larger crimes that “Broken Windows” ascribes to. Cohn’s paper uses KGB journals on policing theory, archival documents from Lithuania, and personal interviews to provide evidence for connection. He stated that one of his broader project goals was to understand how these prophylactic chats worked and how to understand, in his view, their ultimate failure. Professor Rozenas then presented his comments to Cohn, using his own expertise on the Baltic case. First, he commended Cohn for analyzing why prophylaxis was targeting people who, in the eyes of the state, would never become “major dissidents.” Second, Rozenas asked Cohn about the connection between prophylaxis and “spillover effects,” the possibility that one person’s anti-Soviet statements would lead others to question the regime. He asked if this was a connection Cohn made or is one that the KGB themselves made. In addition, Rozenas asked Cohn to look at these tactics in the context of deterrence in the Soviet Union, especially considering the very public violence of The Terror. Cohn responded that the KGB saw prophylaxis in the terms of the “spillover” that Rozenas mentioned. In Cohn’s view, the KGB was concerned about the milieu (or okruzhenie) of the individuals whom they chatted with. In the remaining time, Professor Yanni Kotsonis, Direct of the Jordan Center and Professor Susan Smith-Peter of the College of Staten Island (CUNY) both pushed Cohn to explain what kind of state he described in his analysis: was this an individualized form of government? Was this a strategic way to find informants? Cohn responded by speaking of prophylaxis as connected to a system of surveillance, but one that remained independent of the state insofar as it had its own distinct goals. Samuel Casper, a Jordan Center Writer in Residence and PhD Candidate in history at the University of Pennsylvania, also questioned how to classify those who were asked to meet with the KGB and whether or not they could be considered “victims.” The colloquium concluded with a discussion on Cohn’s assertion that prophylactic policing was a failure, which brought up important debates about the legacy of the Soviet Union in the Baltics.